Poop. We all do it. Excreting out waste we don’t need. While it may be a “faux paw” to talk about poop, there’s a ton of value we can extract from our poop. In this post, we are going to talk about the importance of regular bowel movements and honoring digestion, the different types of poop, and how you can improve your digestion and poops. Lack of chewing when eating – prevents the enzymes in the mouth from fully breaking down the food. Allows large food particles to enter the gut that can become more difficult for the stomach to breakdown allowing parasites and fungi to transition into the small intestines where the alkaline environment of the small intestine can become a feeding ground for bad bacteria. Too much stress, or sympathetic drive, around feeding time – In order for us to optimally digest and assimilate our food, we need to be in a parasympathetic state. When we are in a parasympathetic state, we are able to secrete the necessary enzymes for digestion throughout the G.I. tract. When we are too stimulated, we can inhibit proper enzymatic activity for digestion minimizing the utility of the foods we consume. When it comes time to eat, if we are still too stimulated: sweating, anxious, preoccupied with something, on the phone, or watching intensive television (not an exhaustive list by any means) we will limit our body’s ability to properly prepare and digest the food we consume. We will also become unconscious of what we are doing, chewing less and poorly assimilating our food. If we improperly digest our food, we won’t be able to extract and utilize the nutrients in the food causing us to have irregular bowel movements, which can lead to malnourishment, poor performance and lack of recovery. Optimal detoxing abilities, pooping being one of them, will ensure our system keeps inflammation at bay. Keeping inflammation at bay will maximize our ability to perform and recover. This is why honoring food hygiene is one key to great digestion, and poops. Now that we understand the beginning stages of poop formation and its importance, let’s talk about the different types of poops. I’ve included a picture of the Bristol Stool Chart (see below). 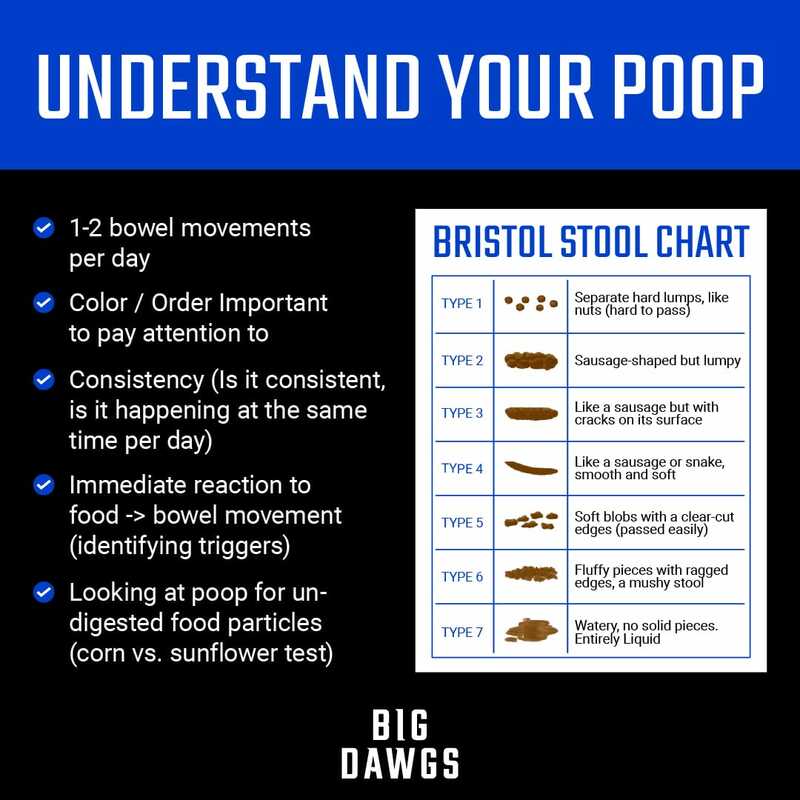 A tool/chart I use with my clients to help educate them on what is healthy and what is not when it comes to their poop. We will start at the top and work down the line. Supplemental support; highly individualized. There are tools we can use to help improve digestion, but the foundation must always be present: great food hygiene. Look at your food hygiene, are you tasting your food? Are you chewing your food? Lastly, look at your training. If your program is not tailored for you, it could be causing unnecessary stress and inflammation on your system that you can’t recover from. This will negatively impact your ability to digest and remove waste. Start getting to know your poop and watch your performance soar. Not sure where to start? Contact us about working with a coach.